Historic railway station gets a stunning new entrance canopy. 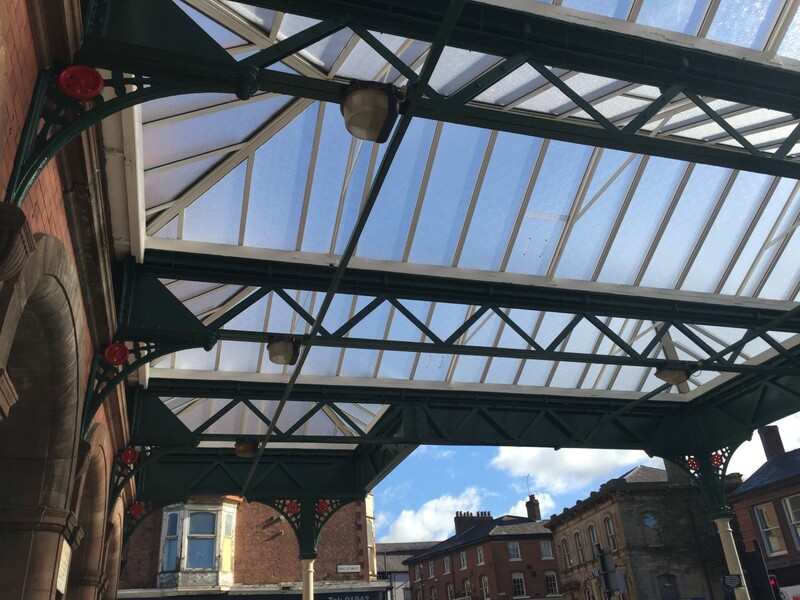 An innovative modular rooflight system that can be installed in a fraction of the time of traditional split-bar glazing systems and is also non-fragile was the “cherry on the cake” for the refurbishment of a main line railway station’s Grade II listed entrance canopy. The Multi-Link-Panel system glazed with Georgian wired polycarbonate from pioneering polycarbonate roofing supplier Twinfix was specified by Network Rail for the entrance canopy element of a £1 million refurbishment of historic Wigan Wallgate station in Lancashire. 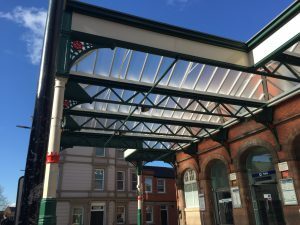 The glazing panels, each comprising fast-track “fix and link” aluminium structural bars glazed with 6mm solid Georgian wired polycarbonate, were pre-assembled at Twinfix’s factory in Warrington, Cheshire, for delivery to site for installation by specialist contractor Everlast Rail. 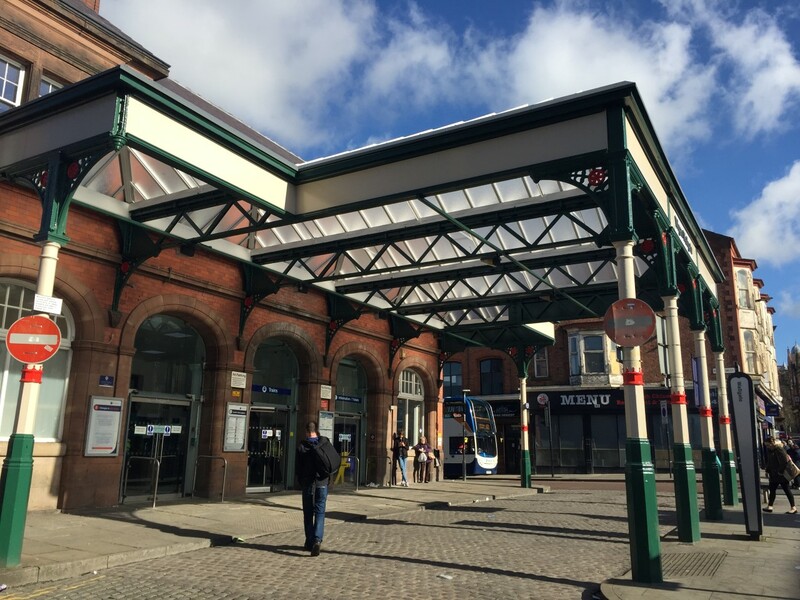 Everlast’s contracts manager Colin Duxbury said: “Though we had knowledge of this system, we had not previously installed it. Twinfix arranged the delivery of all components to our site compound behind the station. The components were all marked up and came with a layout drawing showing which piece fitted where. 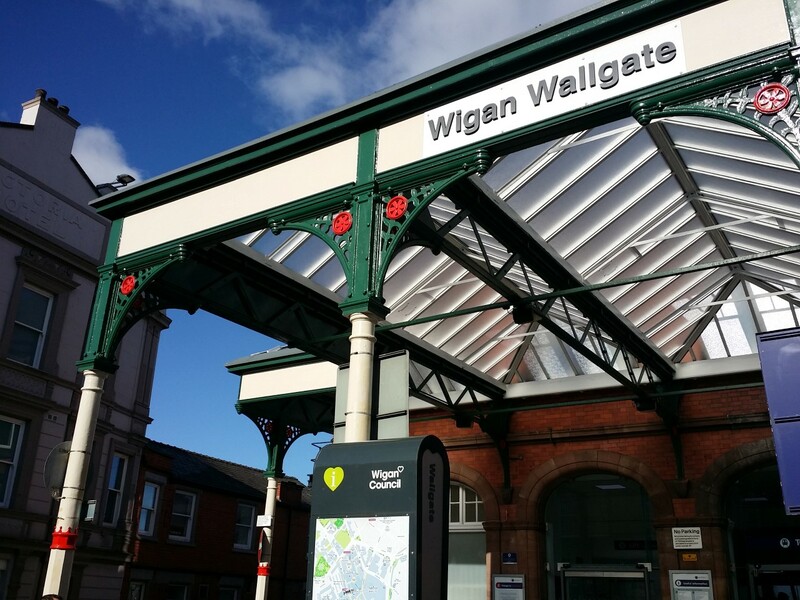 “The installation was relatively straightforward aided by a couple of instructive visits by Twinfix installers. The relatively narrow gutters made for a tight fit for some components but all in all everything came together on time with thanks to Twinfix for making a couple of emergency deliveries. The refurbishment of the Grade II listed canopy, which had been leaking, included the redecoration of all steelwork, the liquid waterproofing of canopy gutters and the replacement of the traditional glass with Twinfix’s lightweight polycarbonate system. 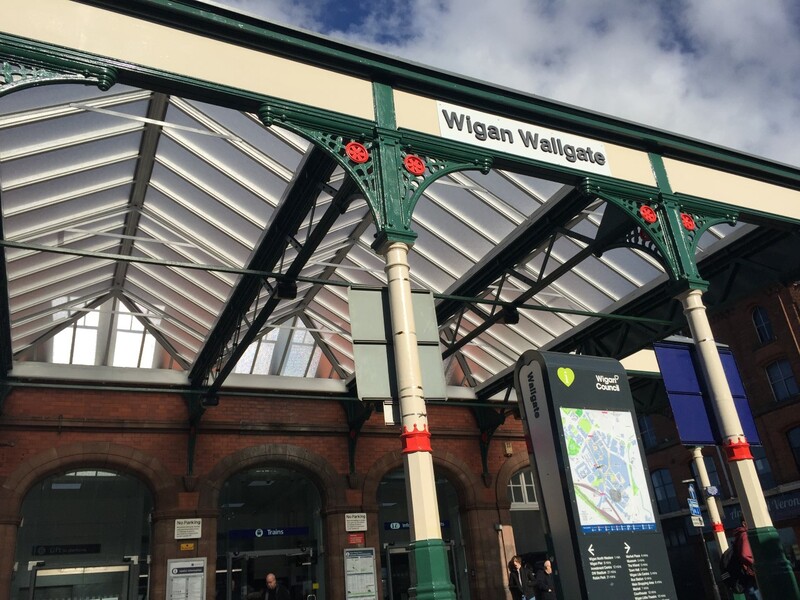 The 120m2 canopy at Wigan Wallgate is a steel-framed structure with three central lantern bays, each with a pitched glazed roof approximately 9m long by 3.5m wide, with similar but shorter bays each side of 3.5m in length. The Twinfix panels were installed at 600mm centres. 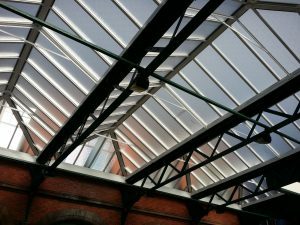 To comply with planning requirements an additional detail was added to the standard design in the form of a small triangular fin at the top of each glazing bar. 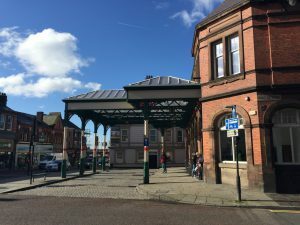 The purpose of this fin was to keep the glazing bar in keeping with the look of the original bar, ensuring a sympathetic restoration of the station. “This could only be fitted once everything else was in place and there’s a lot of them,” said Colin. 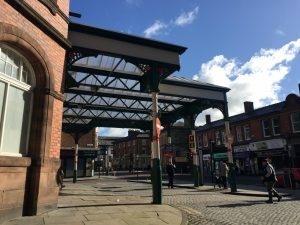 “There was a lot of work to be done in a relatively short time and as the canopy works rolled into autumn, the weather began to turn which affected the painting of the steelwork and the liquid lining to the valley gutters, all of which had to be completed before we could install the glazing. 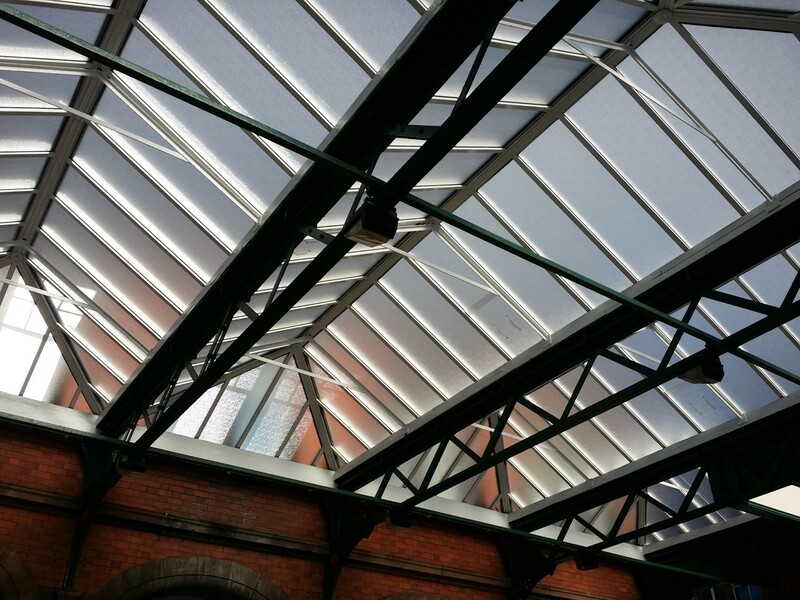 Fortunately, the glazing itself could be installed regardless of the weather. 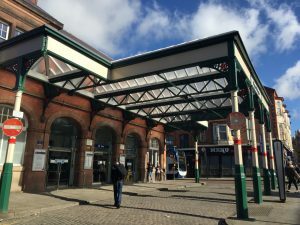 The new canopy was just one element of the station refurbishment which included a new main slated roof, replacement of all first-floor windows and suspended ceilings, and repointing of external brickwork and chimneys. Paul Childs, company secretary for the Railway Heritage Trust which part-funded the project, said: “The trust was most impressed with Network Rail’s recent sympathetic refurbishment of the forecourt canopy at Wigan Wallgate, particularly the use of Twinfix’s Georgian wired polycarbonate.